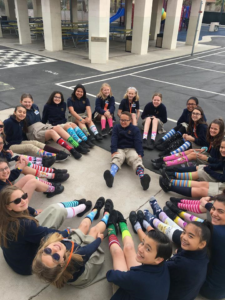 Today is World Down Syndrome Day and students at St. Viator Parish School in Las Vegas takes that celebration seriously. 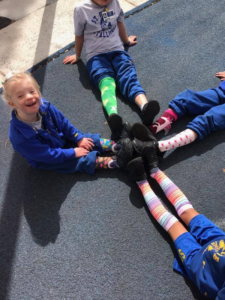 They are joining with people around the world in wearing mismatched socks, in order to celebrate the differences and what makes people unique, while supporting people with Down syndrome. 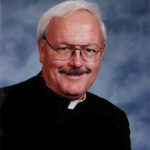 That verse, taken from the 6th chapter, is the school’s motto but it also represents its groundbreaking program of inclusion, which is the only one of its kind at a Catholic school in the state of Nevada. The Micah Program aims to provide students with physical and intellectual learning disabilities a Christ-centered environment in which to learn. The program strives to maximize each student’s abilities by developing the whole person, academically and socially. 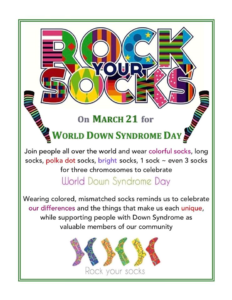 Currently, there are two students with Down syndrome in the school, and their classmates had fun celebrating with them today.